Immediately after I had signed up at the Reception Centre in Montreal I was shipped out to No. 2 Manning Depot Brandon, Manitoba. The trip from Toronto to Brandon, through Northern Ontario bush country, along Lake Superior and the lake country from Thunder Bay was very impressive, especially for the first time. 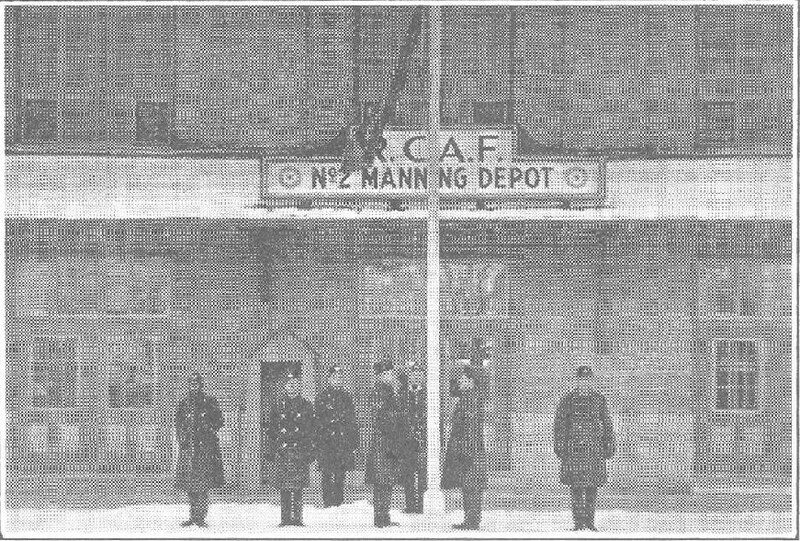 RCAF No 2 Manning Depot Brandon was then under the command of W/C R.M. Smith along with officers S/L Sewell, F/L Knight, and W/O Sullivan. 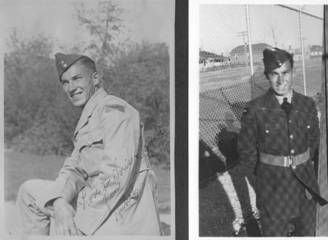 For the first few months (August to October 1940) I was given basic training at Brandon Manitoba. 2 M.D. 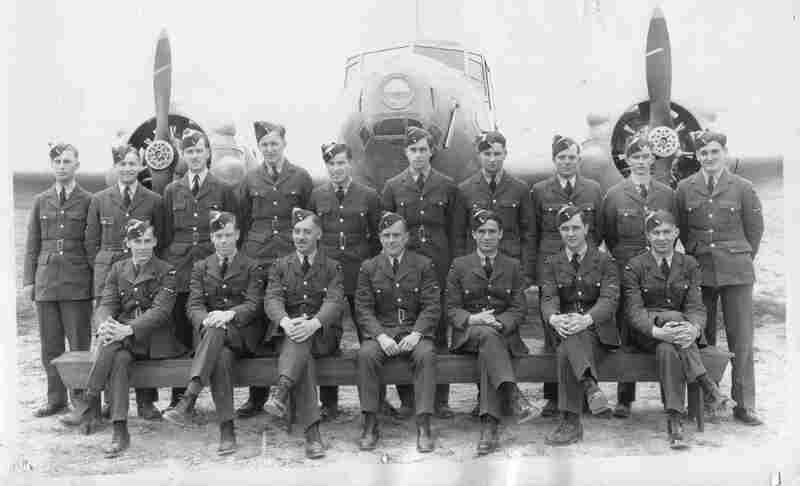 (Manning Depot) unit was part of the British Commonwealth Air Training Plan School system Ref: 1.33 Ref: 1.35 Ref: 1.36 Ref: 1.38 and the majority of crews in Bomber Command squadrons went through one of these. 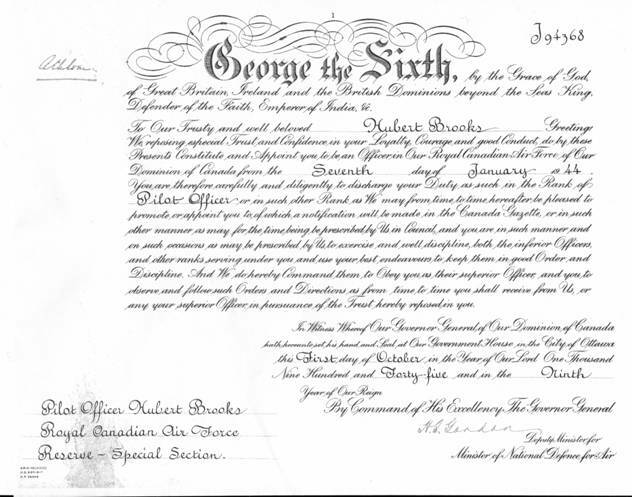 We were confined to barracks at Brandon for the first two weeks while we received our uniforms, medical examinations, induction lectures, and introduced to military discipline. 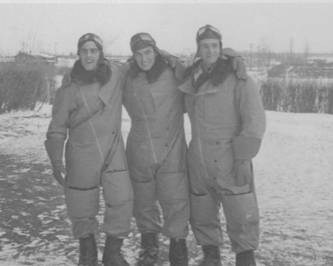 These RCAF Manning Depots were basically a station where civilians were transformed into uniform material suitable for further aircrew training. 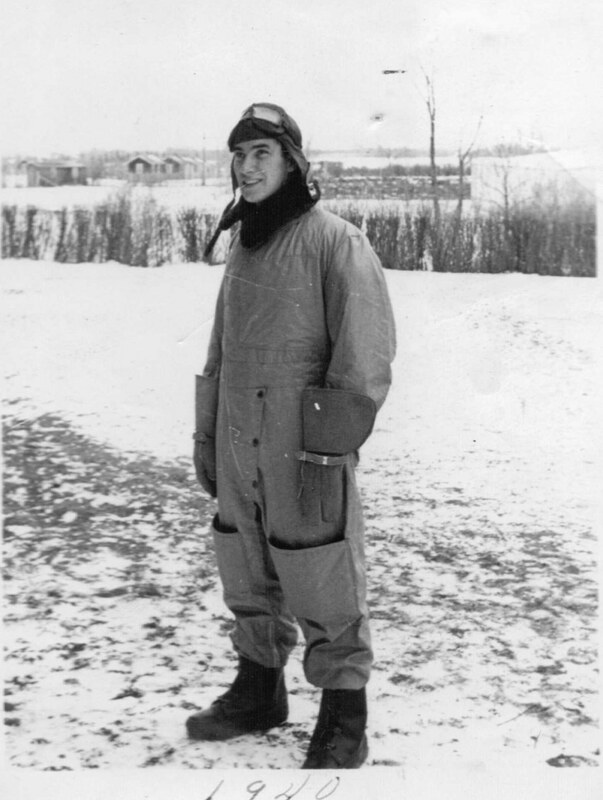 As mentioned, we were issued various articles of our uniform: shoes, socks, underwear, shirts, pants, coats, wedge cap, shaving kits, shoe polish and brush, towels, soap, etc., everything an airman would need. We had our first inoculation parade a few days after our military style haircut. We had heard about these inoculations and how bad they were. For those who dreaded needles this was a memorable day. We rolled up our sleeves on both arms and we walked between a bevy of white gowned swabbers, doctors, and "catchers" (for those that fainted). We got 5 needles in about a minute and a half. I was surprised to see so many guys keeled over when they received the TABT shot. Military life consisted of large numbers of rules and regulations, which had to be obeyed, and as long as a person complied, it was not unpleasant. We also obviously went through the basic training or "boot camp" regime of physical, educational, and military drill. One of the most memorable things about Brandon was the absolutely awful food that we were given. Some time after I had left there the officer in charge of the food was court-martialed for stealing supplies and selling them to a local restaurant. Sports programs were carried out as part of our training, and we were regularly entertained by various celebrities, Marlene Dietrich visited, and entertained, giving a very impressive concert. The parade ground at Brandon Manning Depot was known as the gopher patch. Apparently there was a gopher town there before the military came; the gophers did not want to leave. As a consequence, care had to be taken when marching to avoid stepping into a gopher burrow. 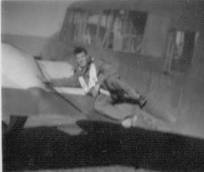 In October 1940 (from October 9th to October 20th) I was sent to the 7 E.D. (Equipment Depot) unit in Winnipeg where I was assigned to ‘guard duty’ while I waited for an appropriate course to come up at an ITS (Initial Training School). In the morning reveille was at 6 a.m. 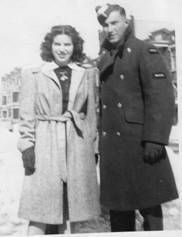 The fire bell went off and one would wash up and shave, fold blankets and sheets, polish boots and buttons, clean and dust rooms, hustle to the adjoining building for breakfast, return and pick up books, march over to the gymnasium in time to go on parade at 7:15 a.m.
A short time later, officers appear and we received inspection. We would march a mile and a half to the normal school, where we took classes from 8 a.m. till noon. We marched back to the mess hall and ate lunch at exactly 12:15. At 12:45 we marched back to normal school from 1 p.m. to 5 p.m. We were given three hours homework each day. Every day we drilled on the Parade Square. At that time we were given white flashes to wear on our air caps which marked us as aircrew. The I.T.S. 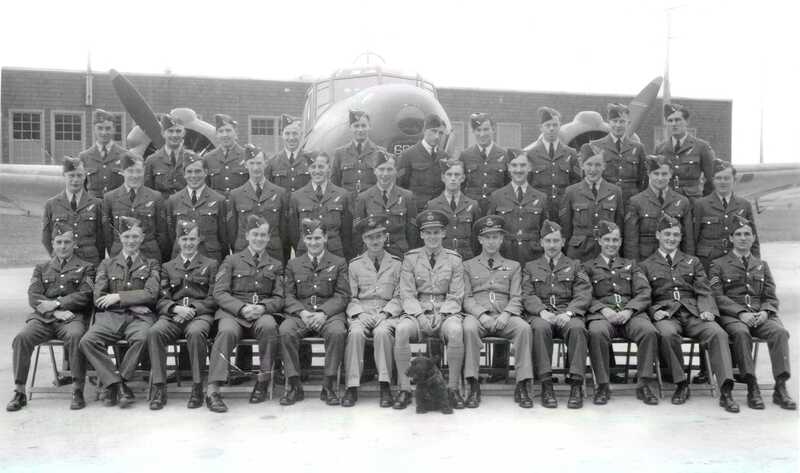 course was six weeks and all the officers were former school teachers, and on the basis of their assessments, they recommended the best cadets for further training as pilots, navigators and bombardiers. Some cadets who could not absorb the academic side of the course were offered wireless operator and air gunners. The toughest test at I.T.S. was the M2 Second Medical. This took about four hours. Careful colour vision and depth of vision checks and testing whether you could stand on one leg with your eyes shut. We worked hard at school. With the exception of Navigation, I found the rest of the subjects largely memory work. Whether one became a pilot or navigator, navigation was absolutely essential. During the six weeks at I.T.S. we had 90 hours of navigation lectures and about 150 hours navigation problems. While navigation was the heaviest course, we also studied theory of flight and airmanship. We studied engine inline, liquid cooled and air-cooled, and radio. We took aircraft recognition and we took signals, Morse on Buzzers and Aldis lamp. To qualify we had to receive a minimum of eight words per minute. We also took armament, war gases and elementary meteorology. We had training in a link trainer. It was a stubby winged little trainer. You had to hold the nose in one position and keep the machine from moving sideways while you roll over on its side. We also tested out gas masks. We put on our masks and wandered around in a room full of tear gas for ten minutes with no ill effects. Then we were told to take off our masks. We choked and sputtered our way out the door. This was to give you complete confidence in your respirator. We had a dental parade and all our cavities were filled. After the course, we were issued two flying suits, helmet and a pair of goggles. then 27–November–1940 to January–1941 to: #3 E.F.T.S. (Elementary Flying Training School) in London Ontario. 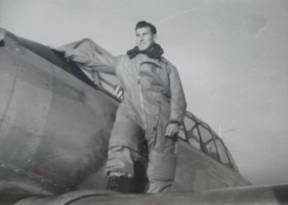 (R/64432) James Waldon Creeden (DFM - 407 Sqn. ), won silver cup for the highest standing and the highest marks for efficiency. 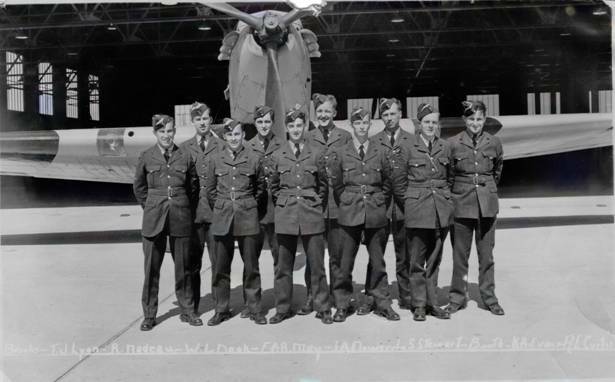 (J/4419) Ian Edward MacTavish, (J/4102) Andre Rene Morrissette (AFC), (J/4103) Frederick Duncan McKechnie, (J/15257) John Douglas Snider - DFC 419 Sqn., Ian Edward MacTavish, Jack George Blinkhorn, (R/56265) Hubert Brooks (CT); (J/3995) John Alexander Spence - DFC & Bar 277 Sqn. I arrived at London with two duffel bags containing my bulky new flying suits and high topped fur-lined boots. We were given a new school curriculum more advanced than the ITS course but directly related to it. There was great emphasis on navigation and armament. We learned to strip a Browning 30 calibre machine gun and explain how it worked. We were introduced to aircraft. We were going to fly the DeHavilland 82c Tiger Moth, wingspan 29 feet 4 inches. She was a graceful, rather delicate looking biplane with a plastic coupe top to cover the two tandem seats. She weighed 1,115 pounds empty and had 145 horsepower, gravity fed inverted gypsy major engine. Being a training command aircraft she was painted the standard shade of yellow. We had familiarization exercises for a few days and then we had to report to flying classes. We went into the flight room to hang our flight gear in our newly assigned lockers. There are old pilots, and bold pilots. We started flying at 3:30 a.m. as the air was smoother at that time. Every second morning we could sleep in till 6 a.m.
After 8 hours, I did my first solo. I had no trouble and landed very smoothly. The next day, I did circuits and humps, take offs and landings. We did lots of aerobatics practice. We took instrument flying. A hood was pulled over your head. 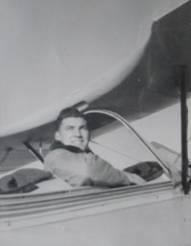 All you could see was your instrument panel, black topped stick, throttle and rudder pedals. All you watched was needle, ball, and airspeed on your panel. This was very tough to do as you had to know how the depletion of oxygen at high altitude affects you. It made you feel dizzy and light-headed. Upon completion of E.F.T.S. I was promoted to the rank of LAC or Leading Aircraftman…and given 2 weeks of leave. 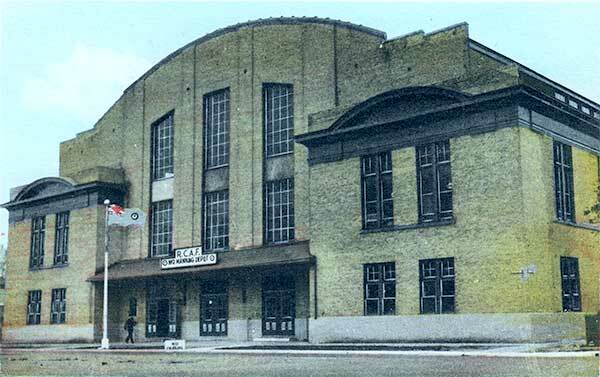 from January to end of February 1941 I was at #1 Manning Depot in Toronto Ontario. 1 M.D. was located at the Canadian National Exhibition Grounds in Toronto. 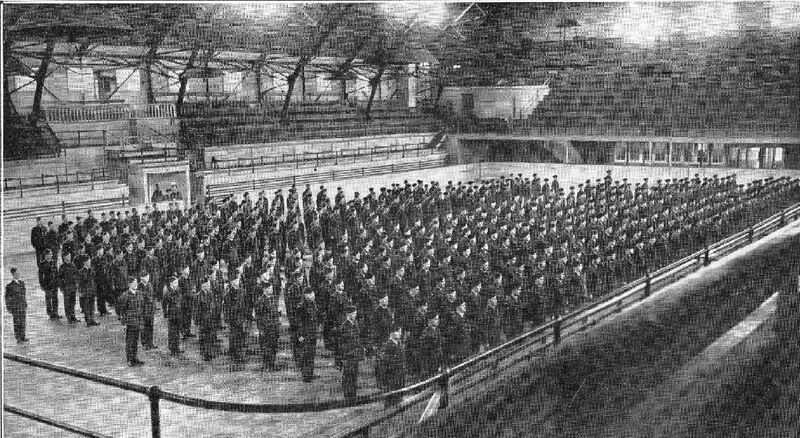 This was where recruits from Canada, the United-States and all around the Commonwealth were gathered together, awaiting assignments to bases across Canada to begin/continue their training to become pilots, observers, air gunners and ground crew in the RCAF. In one huge building there were six thousand men in double deck bunks. It was incredible. However the food was good and the beds comfortable. Essentially this was a staging area for me until my next training assignment. then 3-March-1941 to 25-May-1941 to: #1 A.O.S. 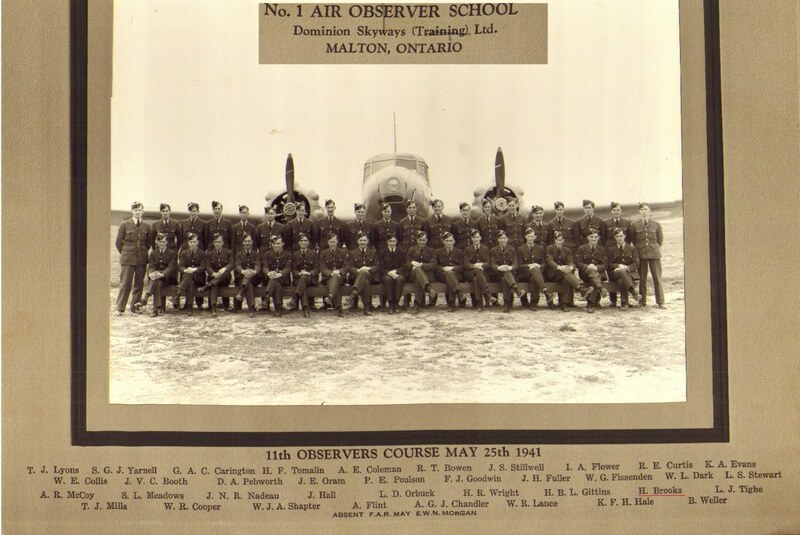 (Air Observer School) in Malton, Ontario Ref: 1.34 Ref: 1.37 where I was trained under the U/T (Under Training) Observer Course. At the Air Observers school, we did bombing and photo flights. 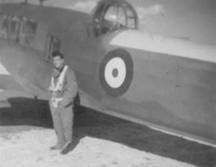 I accumulated a little more than 69 hours of day time and slightly more than 12 hours of night time flying on the course with an Anson 1 aircraft. We started out at Malton and would fly to Oshawa, Orillia, Baden, Port Dover, Port Perry, Argyle and so on and return to Malton at the end. I passed with a grade of 65% - good but not great. Upon passing the 'specialist' Observer Trade Course with an "above average" grading, I was promoted to the rank of Sgt (Sergeant) effective 7-July-1941. then 25-May-1941 to 6-July-1941 to: #4 B.& G.S. (Bombing and Gunnery School) in Fingal, Ontario (just south-west of St Thomas) where I acquired bombing and gunnery training. We learned about the terminal velocity of bombs, which told us how fast they would fall if they were streamlined or not. We did over twenty-five hours dropping 6½ pound practice bombs. 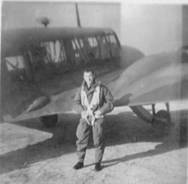 We often went on firing our 303 machine guns at drogues pulled by an airplane. Every 5th shell was a tracer so you could watch where your bullets were going. When it was your turn to shoot, you were designated a colour for your shells. This colour showed up on the drogue if you hit it. We spent about 10 hours doing this. I got a 66% on this course – consistent with my last grade!! See website NO. 4 BOMBING & GUNNERY SCHOOL FINGAL for PHOTOS and a video along with training course participants at the RCAF Fingal training facility. then 7-July 1941 to 18-August 1941 to: #1 A.N.S. (Air Navigation School) in Rivers Manitoba (a hamlet situated about 20 miles from Brandon Manitoba) where I learned to navigate by the stars which is called astro navigation. The purpose of 1 ANS was to teach advanced navigation to air observers who had graduated from bombing and gunnery schools. The location of Rivers, Manitoba was selected because the climate allowed generally cloudless skies which was ideally suited to the instruction and training of astro navigation. 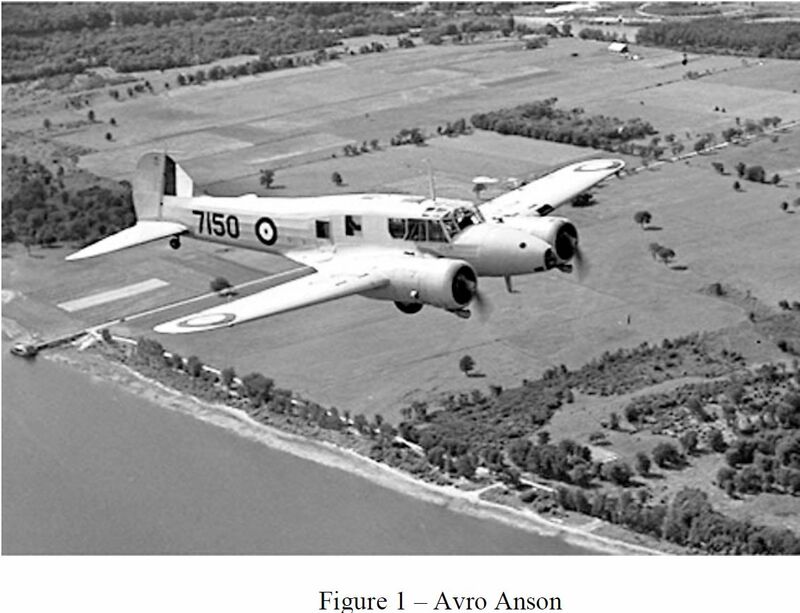 We were trained on Avro Anson aircraft. On this course I accumulated 12 hours of day time flying and a little more than 34 hours of night time flying. Although there are literally billions of stars in the sky, only a very limited number in each hemisphere can be relied upon for navigational purposes. In order to establish a plane's position on a navigational map one had to obtain readings on two stars with a bubble sextant from the airplane's plexiglass astrodome. I had had some previous training on the sextant at Air Observer School in Malton but nothing as concentrated as now. For this course, the sextant we used had a bubble as an artificial horizon to obtain the altitude of the stars, in contrast to a naval sextant which uses the true horizon. One then plotted these readings on the navigation map and, if one's work had been done accurately, one would obtain their exact position. In addition to using the sextant on practice flights, we were required to take 250 star shots on the ground and plot them using the international air almanac. To complete the exercise and to find the required stars in the summer sky. This was involved work that utilized navigation books, Greenwich time, correct readings, and a lot of self-assurance. In the air in the Avro Ansen it wasn't quite that easy to deduce one's exact location but under ideal conditions we could fix our position within a couple of miles. Astro navigation was intended to be a supplement to all the other aids. More often we used Polaris, the pole star, as a general reference point to satisfy ourselves that the compass was behaving. 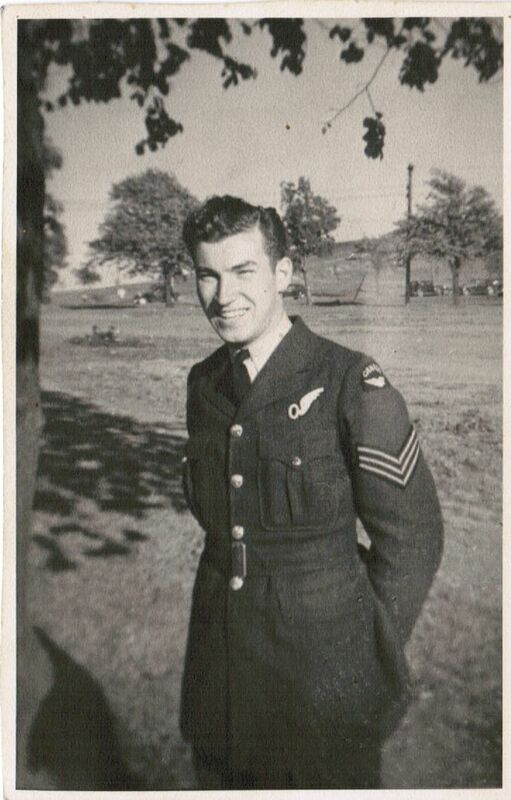 By 18-August-1941, I had graduated from all of my courses and was set as a navigator – bomb aimer. 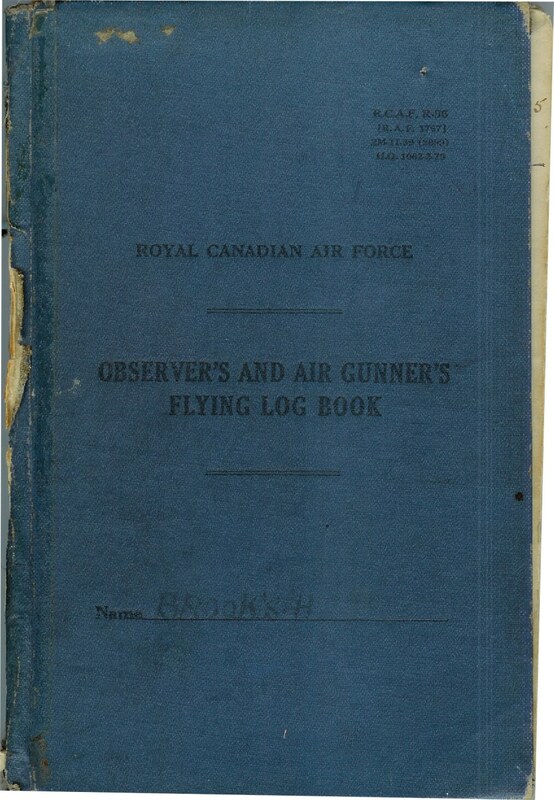 In June 1942, it was decided that these duties were too much for one person and the position of air observer was broken up into two positions: navigator and air bomber. 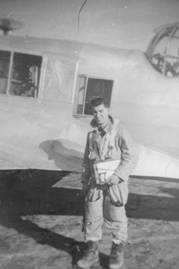 A navigators badge was a "N" half-winged brevet and an Air Bombers or Bomb Aimers badge a "B" half-winged brevet. The "N" badge was not at all popular with the observers. 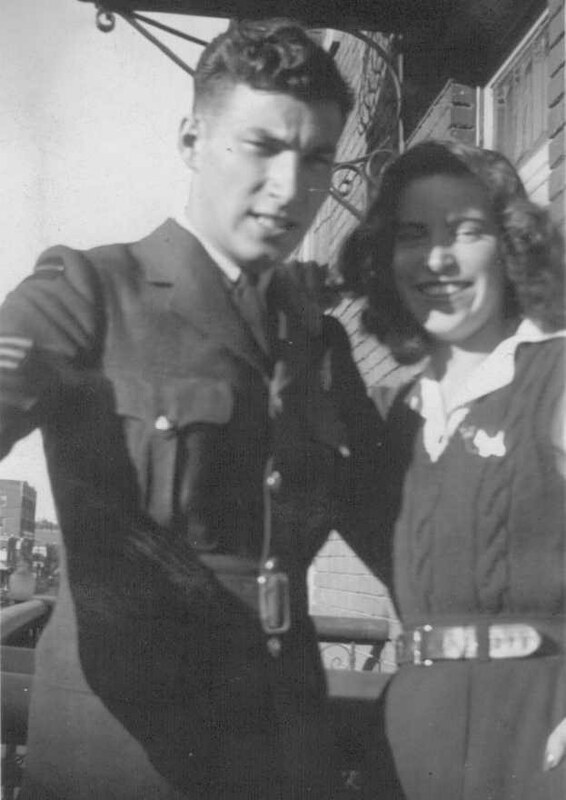 After graduation the air force gave me 2 weeks holiday so I could return to see my folks in Montreal before departing for Europe and off to war. And as stated in my description of my training program in the foregoing, I had also managed to get a few hours on some “fixed wing” aircraft. After my holidays, I was sent to Halifax. Here we had a document parade, making out of our wills and received a whole new set of inoculations. On 14-Sept-1941 I boarded a ship – I think it was the Mauritania as best I can recall – for the U.K. We had fairly good accommodations. We slept in hammocks four deep with about eight inches between them. The ship was packed with troops. 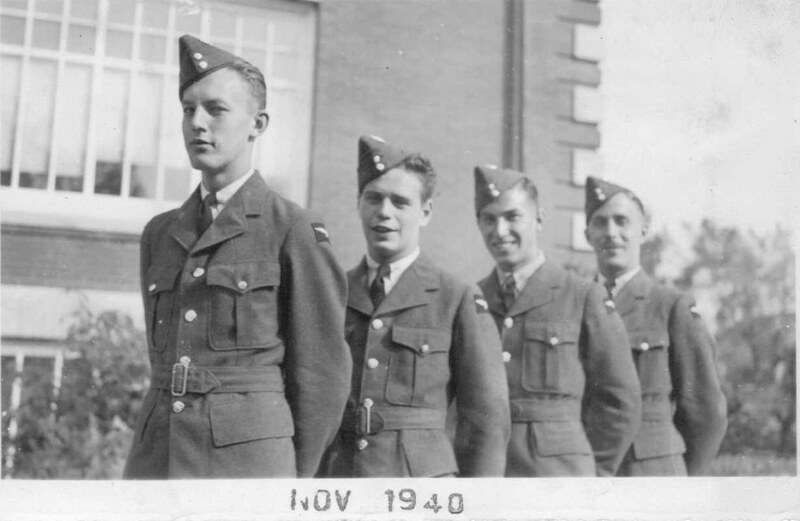 We arrived in the U.K. on 29-Sept-1941. I was now one step closer to the action!